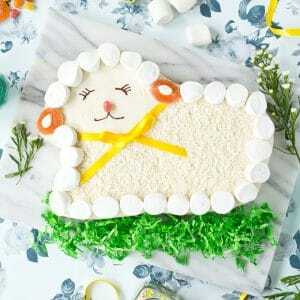 If you grew up in a family that served lamb cake for Easter dessert, this probably looks familiar. 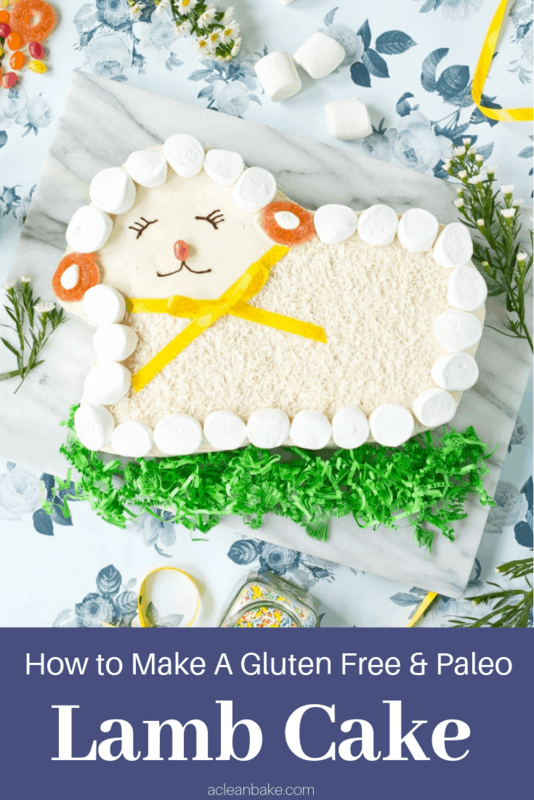 I created this paleo lamb cake for those of us who want to participate in the tradition, while staying grain free! Don’t look at me like that. I promise I am not posting a massive undertaking of a cake project just days before the holiday you serve it for. I know you’ve already planned your Easter menu, I know, but this paleo lamb cake is a totally manageable and worthwhile late addition to the lineup. It’s not often that I – the least artistic of bakers – does a project here, but I just had to show you this one. It looks rather impressive (if I do say so myself), but if I can do it, LITERALLY ANYONE can. 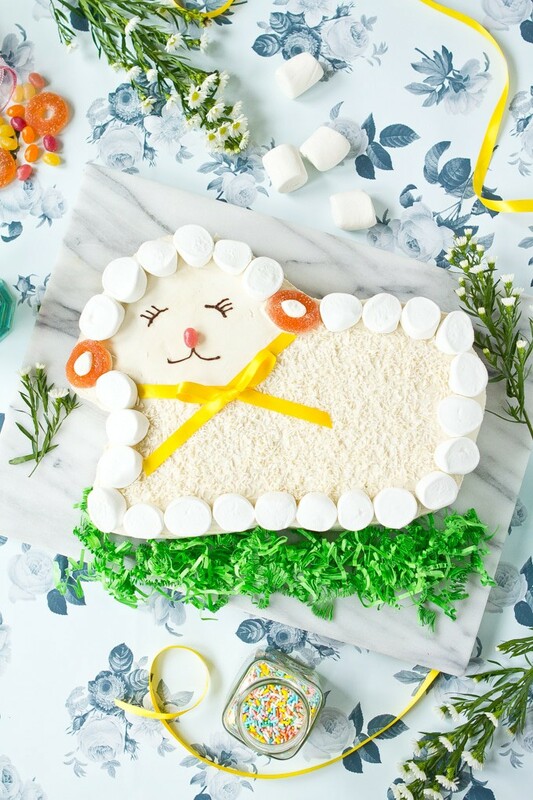 All it takes is a cake (made in a mold or a sheet cake cut into a lamb shape), some frosting, and some strategically-placed coconut, marshmallows, and a few other candies. I got all of these ingredients at my local Whole Foods (except for the NOW shredded coconut), but you can also get them online. Scroll down below the recipe to grab all of the ingredients from Amazon. 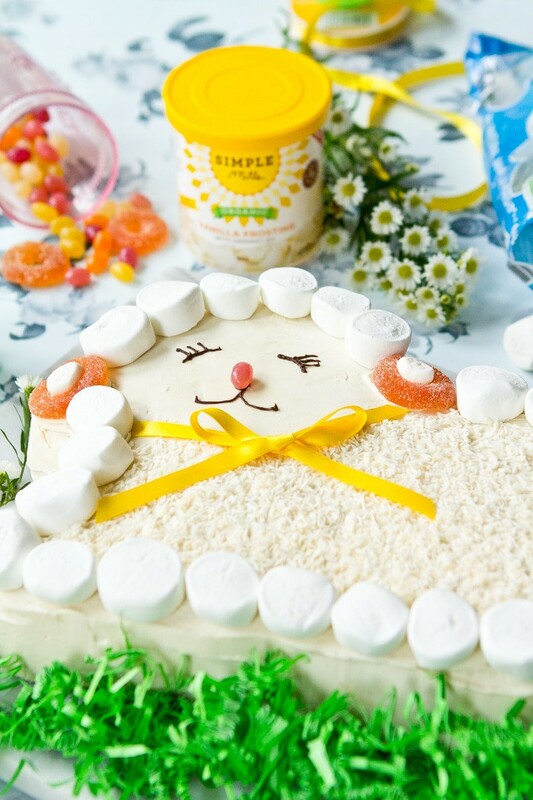 For the cake itself, you can either use Simple Mills vanilla cake mix or make your own from scratch. Depending on the size of your cake, you may need to double the batch. For example, if you use the same lamb cake mold I used (this one), you’ll need a double batch of cake or two boxes of Simple Mills vanilla cake mix. The recipe below is more of a method and one that you are free to riff on if you want to! 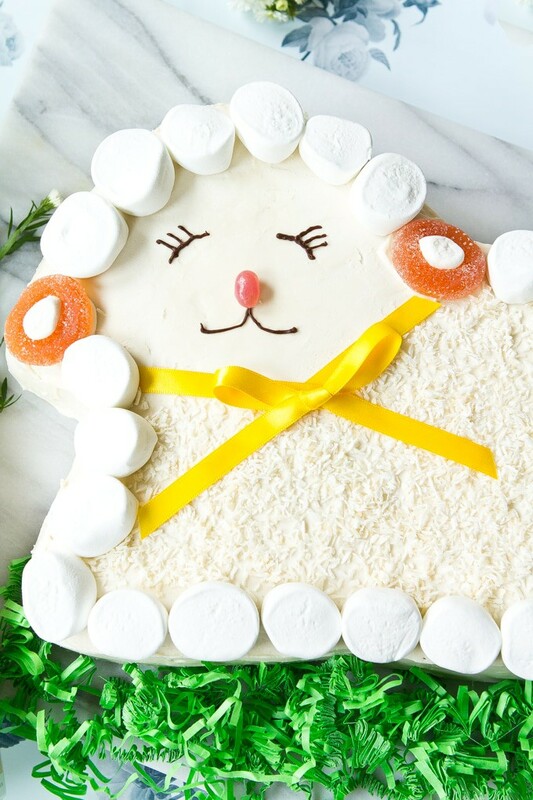 If you make your own paleo lamb cake, I’d love to see it! Please email me a picture (nora@acleabake.com), or tag me on social media (@nora_acleanbake on Instagram, @acleanbake everywhere else) so I can take a look! Prepare the cake according to the recipe. If using the pan recommended in the notes, you'll need to double the recipe (or use 2 boxes of Simple Mills mix). The bake time will be about 35-40 minutes, or until a tester inserted into the center comes out clean. Cool the cake in the pan for 20-30 minutes. Before it is completely cool, turn the cake out onto a cooling rack. Tap the pan all over to gently remove the cake and prevent any sticking. While the cake is cooling, gather all of the decorating ingredients. Cut all of the large marshmallows in half width wise to form 28-30 shorter, round marshmallows and cut the small marshmallow in half width wise and pinch it at both ends to form two oval marshmallows. Once the cake has cooled completely (or chilled in the refrigerator – see note), transfer it to the serving plate and apply 1-2 layers of vanilla frosting. Then decorate. The frosting sets quickly, so work fast! Pinch the ends of each peach ring together to make it into more of an oval shape. Place each peach ring ear, then set one of the halved mini marshmallow ovals in the center of each ring. Next, use a toothpick to draw a faint line in the frosting to mark where the ribbon will go. Sprinkle the coconut evenly over the body of the lamb, right up to the ribbon line. Place the ribbon over the line and the coconut. Melt the chocolate and transfer it to a small zip top bag. Seal the bag, pressing all of the air out of it, and squeeze all of the chocolate into one of the corners. Use a clean pair of scissors to snip a tiny triangle of corner off of the bag and squeeze the chocolate out of the bag to form the face. You may want to trace the face in the frosting using a toothpick before you start drawing with chocolate, so that you have something to follow. Add a tiny dot of chocolate right above the mouth and press the jellybean into it. Allow the frosting and chocolate to set for a few minutes before serving. The from-scratch cake recipe is available here. The Simple Mills mix is available at most Whole Foods, or on Amazon. Prepare the cake batter according to the recipe, either way. Simply double the recipe for a large cake pan, such as the one mentioned in the next note. The cake pan used for this recipe was the Wilton Gentle Lamb Cake Pan, available on Amazon. If using this pan, the bake time is about 35-40 minutes, and the cooling time is about 30 minutes. Depending on your cake pan, you may only need one batch of cake or one mix. If this is the case, watch carefully and reduce baking time if necessary. If you have time, it helps to make the cake the day ahead, wrap tightly in plastic wrap (after it has cooled completely to room temperature), and refrigerate overnight before frosting. Frosting the chilled cake helps it hold together so that you won’t get too many crumbs in the frosting layer. Tip: Add small pieces of parchment or wax paper under the cake while you’re frosting that you can pull out when you’re done. These catch any smudges of frosting leaving your cake plate clean! I used Dandies marshmallows (large and small) and Surf Sweets candy (peach rings and jelly beans). Both are better-for-you brands, as candy and marshmallows go. If you’re having trouble getting the marshmallows or peach rings to stick, use a tiny dot of frosting underneath to act as “glue”. You can make the cake in advance, but try to frost and decorate it within a couple of hours before serving. Store leftovers in an airtight container in the fridge for up to 3 days. Bring to room temperature before serving. Thank you to Simple Mills for providing the ingredients that inspired this delicious recipe. I was also compensated for my time, but all opinions herein are my own. This post contains affiliate links, which means that if you click through and purchase a product, A Clean Bake receives a small commission. All proceeds go toward continuing to bring you delicious, healthy recipes every week, and this does not affect the price you pay. Thanks for supporting A Clean Bake! It’s a great recipe. Thank you for sharing.